How to make homemade tortilla chips! - The Co.
We had a little pot luck to go to recently and I decided to make my favorite Magical Disappearing Taco Dip because it travels well, doesn’t need heating up, and it’s one of those things that you just can’t get enough of. I didn’t want to just buy a few bags of chips to go along with it so I decided to make my own tortilla chips. I’ve made these in the past to go with artichoke dip, or with my favorite 3 ingredient crab dip, but never taco dip. I think it’s a rule though that any kind of tortilla chip will work perfectly with any kind of taco dip, so I knew they’d go well together. -Flour tortillas. I used 3 packs of 10 to fill up my half-gallon container. About 240 chips total. So here’s how you make these chips! They literally take seconds to prepare if you have the right tools. Start out by cutting each tortilla into about 8 equal-ish triangles. Kennedy was my helper for this, as she often is, and we found that we could stack them about 3-6 tortillas high on our cutting board and still be able to cut them easily. 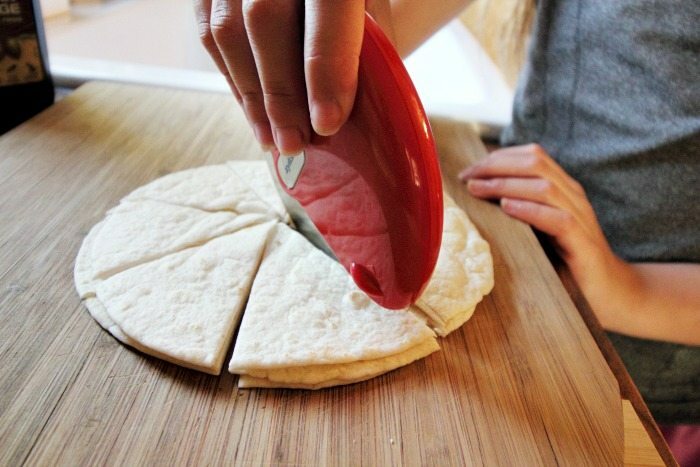 Using one of these pizza wheels where you can press down directly on to what you’re cutting while rolling really helps, rather than the traditional style of pizza wheel with the long handle. If you do them in bunches like this, it will only take a few seconds and pretty soon you’ll have 240 little tortilla triangles ready to go. This is an excerpt from the article How to make homemade tortilla chips! which originally appeared on The Creek Line House.